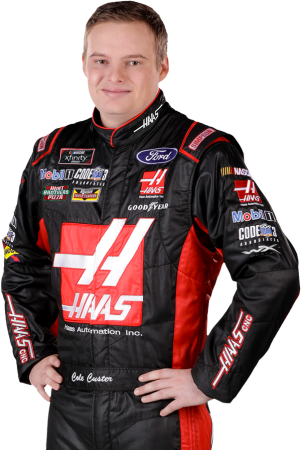 Cole Custer has risen from racing Quarter Midgets at age 4 to regularly competing for championships in the NASCAR Xfinity Series. In a 17-year-and-counting career, the 21-year-old Custer has amassed wins and records befitting drivers twice his age. Custer began 2017 as an Xfinity Series rookie, but by the end of the 33-race schedule, he was more than ready to shed his rookie status and contend for a championship in 2018. This was punctuated by Custer taking the win in the season-ending Ford EcoBoost 300 at Homestead-Miami Speedway. He led three times for a race-high 182 laps to set a record for the most laps led in a single Xfinity Series race at Homestead. He earned a perfect driver rating (150.0) by sweeping both stages of the race and took the victory by a whopping 15.405 seconds. It was the culmination of a strong season that included seven top-five and 19 top-10 finishes with 301 laps led, and it set the stage for an even stronger sophomore campaign. After missing out on the Championship 4 in 2017 by a scant four points, Custer secured his place in the Championship 4 in 2018 with a tenacious victory Nov. 3 at Texas Motor Speedway in Fort Worth. Custer came into the season finale at Homestead intent on winning the Xfinity Series title, and he nearly did, sweeping the race’s first two stages and leading a race-high 95 laps before finishing second to race winner and champion Tyler Reddick. Nonetheless, Custer ended 2018 with double the amount of top-fives (14) and seven more top-10s (26) compared to his 2017 campaign. The native of Ladera Ranch, California, returns to the Xfinity Series in 2019 intent on winning that coveted series title. He again pilots the No. 00 Haas Automation Ford Mustang for Stewart-Haas Racing with Fred Biagi (SHR) as he continues his climb up the racing ladder. That climb began predominantly in open-wheel. From 2003 to 2011, Custer traveled the country earning numerous wins and championships in weekly Quarter Midget races across a variety of series. He graduated to United States Auto Club (USAC) Midgets and Legend Cars in 2010. Custer won 15 races in 22 starts on his way to winning the 2011 USAC National Focus Young Guns Championship. Hiswinning ways continued in 2012 when he began racing Late Model stock cars at age 14. He won three races to become the youngest Late Model winner, which began with his first career start at I-10 Speedway in Blythe, California. Custer turned his attention to NASCAR’s K&N Pro Series in 2013 and ran the entire East Series schedule while also competing in two West Series races. He again displayed his talent behind the wheel, scoring three poles and earning two wins, five top-fives and seven top-10s in 16 starts to finish eighth in East Series points. The 2013 season brought some specific accolades too. In August at just 15 years, 6 months and 10 days, Custer became the youngest winner in K&N Pro Series history by taking the checkered flag at Iowa Speedway in Newton. He did it in style, qualifying on the pole and leading every lap in the annual East/West combination race. In addition to breaking Dylan Kwasniewski’s youngest race-winner’s age record by nearly six months, Custer also became the first driver to lead every lap in the combination race. Custer’s second Pro Series victory looked a lot like his first – he won from the pole in the series’ September visit to New Hampshire Motor Speedway in Loudon, leading 60 of the 105 laps available. When NASCAR announced that the minimum age requirement for drivers in the Truck Series would be lowered from 18 to 16 on road courses and on tracks 1.25 miles in length or shorter, Custer seized on the opportunity to grasp another rung on the racing ladder. In 2014, Custer continued to compete in the Pro Series while running a limited Truck Series schedule driving the No. 00 Haas Automation entry for Haas Racing Development (HRD). Another year in the K&N Pro Series brought another batch of victories – a win from the pole in February at ISM Raceway near Phoenix and a triumph in April at Richmond (Va.) Raceway. Augmenting his Pro Series success was a strong debut in the Truck Series, with Custer earning two poles, a win, two top-fives and six top-10s with 150 laps led in just nine starts. Even with only a nine-race sample, Custer’s first Truck Series endeavor proved record breaking. In just his third Truck Series start in June at Gateway Motorsports Park in Madison, Illinois, Custer set the record as the youngest pole winner in national touring series history at 16 years, 4 months and 22 days. His first Truck Series win came at New Hampshire in just his seventh start. At 16 years, 7 months and 28 days, Custer started from the pole and led three times for a race-high 148 laps to secure a dominating victory. He became the youngest race winner in NASCAR national series history – a record that stands to this day. In 2015, Custer moved to JR Motorsports (JRM) where he continued to compete in a limited Truck Series campaign. He earned his second career Truck Series victory at Gateway in June, a pole at Martinsville (Va.) Speedway in October, two top-fives and four top-10s. He also made three starts in the ARCA Racing Series, where he continued to break records. In just his third start, Custer drove to victory at Pocono (Pa.) Raceway, becoming the youngest superspeedway winner in ARCA history. The 2016 season started off on a high note as Custer won the pole for the season-opening ARCA race Feb. 12 at Daytona (Fla.) International Speedway. Custer, who turned 18 just a few weeks prior, broke yet another record in becoming the youngest pole winner in ARCA history at Daytona. Finally able to compete full-time in the Truck Series, Custer returned to the No. 00 Haas Automation truck for JRM where he ran for the Rookie of the Year title, earning five top-fives and 14 top-10s. And taking a page from previous seasons, Custer simultaneously dabbled in the Xfinity Series, with an eye on advancing full-time to that series in 2017. Custer made five Xfinity Series starts in 2016, debuting with a sixth-place finish at Richmond in May and earning a best finish of fourth in his second race later that month at Charlotte (N.C.) Motor Speedway. When SHR announced in late July that it was forming an Xfinity Series team to develop drivers and team personnel for its flagship Monster Energy NASCAR Cup Series teams, Custer was a natural choice.